I see the low rise buildings at 100 West 37th St have been demolished and the basement is currently being dug out. Back in January the Empire Group were shot down in an application to build a hotel on the site. Anyone know what's happening now? Can't find a thread for it. Bisweb shows 18 story hotel. Nothing exciting, although the zoning diagrams don't appear to show ridiculous setbacks, because it's not that tall to begin with. http://therealdeal.com/blog/2014/01/...n-south-hotel/ is a real deal about it. No rendering. At least it's something. There are some terribly decrepit areas of midtown in need of major work. I see the entire west side of Broadway between 29th and 30th looks to be getting an overall. Half are low rises now all vacated and half is a building maybe 8 or 10 stories tall wrapped in scaffolding. Not sure if it is coming down entirely. Even some of the sidewalks on 5th Ave from 30th going north are so dirty and crumby looking. The area needs a shot in arm just on upkeep. Unfortunately the handsome, larger building in scaffolding will be coming down, too. It will be a Virgin hotel. We discussed this a bit last year here (post# 1072). Post # 1068 in that thread also mentioned 100 W 37. As the city’s plans gel for the Vanderbilt Corridor rezoning, the MTA has quietly reopened the bidding for the long-term lease on its headquarters block at 341-347 Madison Ave. The site between E. 44th and 45th streets is being vacated, and the winning bidder is expected to tear it down and put up a new skyscraper. Developers have until Oct. 14 to amend their bids or submit new proposals, according to the Sept. 17 notice. The MTA sent out its original request for proposals in June 2013. Cushman & Wakefield is overseeing the proposals on behalf of the MTA. Reps for both declined to comment. The agency is asking that new bids for the building be based on a floor area ratio (FAR) of between 24 and 30, or as much as 753,150 square feet. Right now zoning laws would allow 376,575 square feet. There are also requirements to “support public circulation” in the area either on or off site, and the developer would have to meet “findings” with regard to the ground floor level, the massing and energy performance of the new building. The thread for 250 West 55th seems to have been lost? All I want to say is I hate and it's a total dud. A corporate storage box. To think, it's only the second worst new building on the block. I find it bland, but how do you 'hate' something that's bland? It's just there. I agree, Derek. It's crap. I hope that Mordy "Suckerman" does not develop more properties. He's a putz. I'm sure that something like this POS box - by Zuckerman, Moinian, Macklowe, or one of our other local wunderkinds - will replace the gorgeous, classic-NY MTA HQ on Madison. New York, sometimes you kill me. 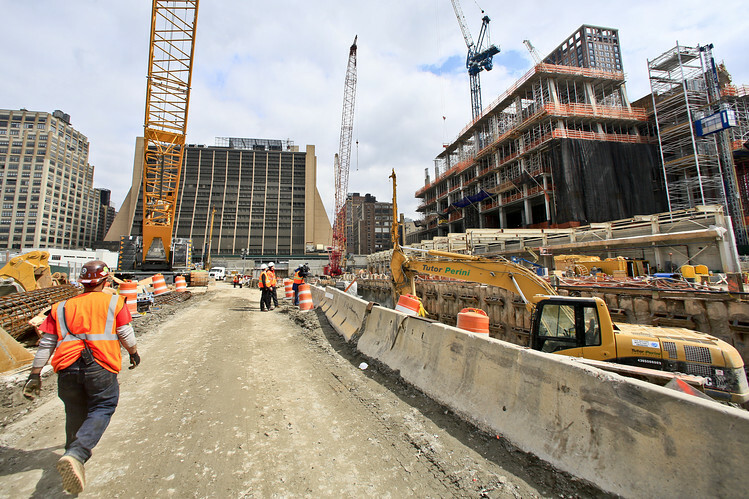 The giant trucks pumping concrete in Hudson Yards, New York’s biggest real-estate project in a generation, are being financed by an unlikely source: about 1,200 Chinese families in search of U.S. visas. In San Francisco, home builder Lennar Corp. has raised about $200 million through the program for San Francisco projects that include more than 12,000 housing units on a former naval shipyard. Developer Forest City Ratner Cos. has taken in more than $475 million for the real-estate project connected to Brooklyn’s Barclays Center. In lower Manhattan, World Trade Center developer Larry Silverstein is trying to raise about $250 million for a 937-foot Four Seasons hotel and condominium going up. In all, 10,928 foreign investors applied to invest through the program in the fiscal year ended Sept. 30, up from 6,346 a year earlier and 486 in 2006, according to U.S. Citizenship and Immigration Services, the program’s administrator. Most projects have been real-estate developments. More than four-fifths of applicants typically win approval and become eligible for a temporary visa, the data show, suggesting the investors who applied this year would fund nearly $4 billion in investment if all of the projects go forward. If the project is found to have produced the pledged 10 jobs per investor, the investors and their immediate families become eligible for green cards. The growing popularity has made for lengthy processing times for investors and developers. But Related successfully urged the federal government to declare the development a project of such national importance that it deserved expedited approval. Raising the money through traditional means would have been difficult because of the yearslong gap between when the platform over the 13-acre train yard is started and when the buildings are completed and income starts rolling in, said Related Chief Executive Jeff Blau. “It was a very critical part of the puzzle,” said Mr. Blau, who expects to rake in hundreds of millions of dollars more from Chinese and other foreign investors as the project progresses. In all, the project’s tab is expected to top $20 billion. Related plans to fund much of that through traditional debt and equity investments, Mr. Blau said, and the developer has invested equity in the platform alongside the EB-5 money. But he expects the $40 million to $50 million the firm is raising each month in EB-5 money to continue to play a major role. The company recently won broker-dealer status in the U.S., helping it to maintain this pace. “It’s so big there’s not enough capital from any one traditional source,” he said. Congress created the EB-5 program in 1990 to spur job creation through foreign investment. It was used infrequently for years. Administrators in 2009 clarified a rule to allow temporary construction jobs to be counted toward the 10-job-per-investor requirement, sparking more activity. The recession, meanwhile, led banks to pull back dramatically from funding new projects, leaving developers to scour for nontraditional sources of financing. The EB-5 program caps the number of visas allowed per year at 10,000; within that total, the number from individual countries is also capped. At times the program has invited scrutiny. The U.S. Securities and Exchange Commission last year warned of “fraudulent securities offerings” related to the EB-5 program, in which investors put money into nonexistent projects. The program also has come under fire because it can be difficult for investors overseas to discern safe investments from risky ones, and if the investment fails to create the required jobs, they don’t get a green card. In addition, claims of jobs created are difficult to verify and the program administrator has been criticized for not having an effective system for doing so. Developers are embracing the program largely because it provides low-cost capital. Money borrowed through the EB-5 program carries much lower interest rates, sometimes half of what companies typically pay, executives said. 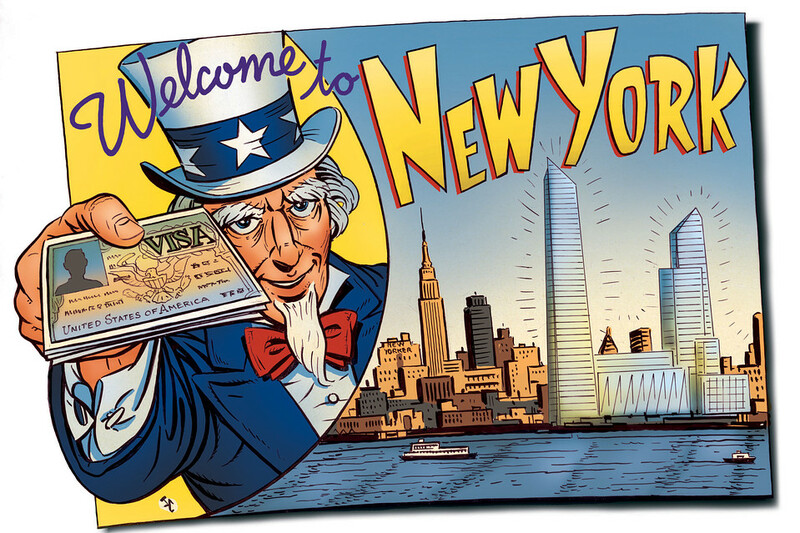 That is because investors are primarily seeking green cards, not a profit, and generally are willing to accept low returns, EB-5 advisers said. The Durst Organization, a family-owned Manhattan developer, used the EB-5 program to raise $260 million in 2013 and 2014 for two apartment towers, about 15% of the buildings’ total construction cost. Durst lawyer Gary Rosenberg said the EB-5 loans generally carried an annual interest rate of 5% to 8% paid by the developer to the investors. Such loans are considered mezzanine, a riskier form of debt; traditional mezzanine financing would have had an interest rate seven or eight percentage points higher, he said. Earlier this year, Durst executives flew to China to pitch their projects to investors. On a flight to Beijing and then again in the lobby of a Shanghai office tower, they ran into a Related executive who runs the Hudson Yards project. —Esther Fung and Wei Gu contributed to this article.